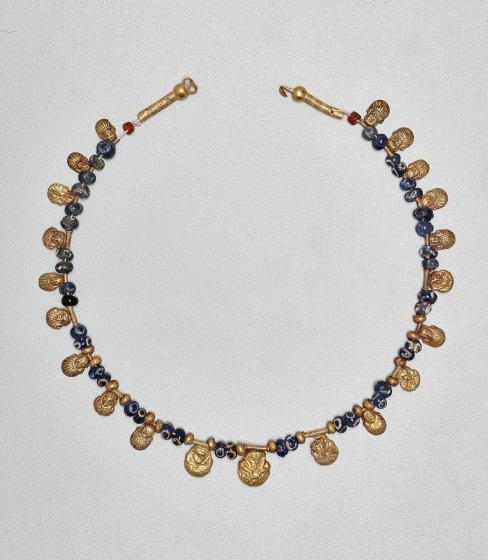 Early Etruscan necklaces are comparatively rare, as their beads were often made of fragile or corrodible materials such as amber, glass, and silver. 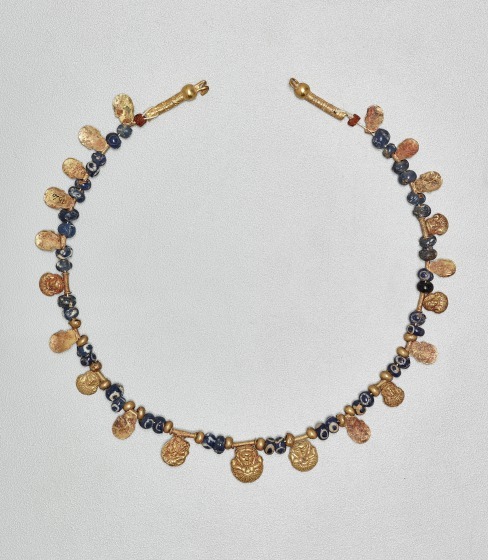 This example is a characteristic composite Etruscan necklace, composed of gold relief pendants and hollow beads, blue and white glass beads, amber beads, and gold finials. The pendants show the head of the goddess Hathor atop a palmette, a widespread motif during the first half of the 7th century BCE. All the pendants are worked in repoussé, with the help of several different punches, and some have granules added to the surface, outlining the details. 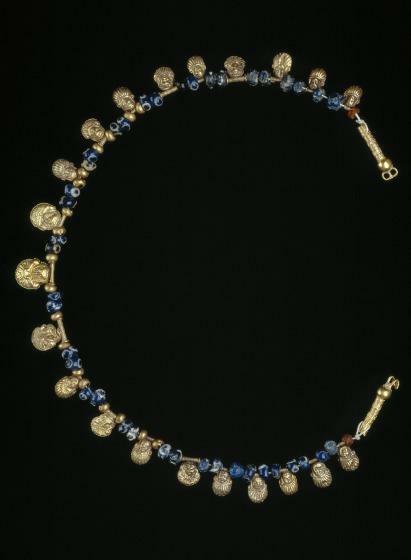 In total, this necklace is composed of twenty-one gold pendants; eighteen globular or cylindrical gold beads, six of them granulated; numerous blue glass beads spotted with white "eyes"; two amber beads; and two gold finials supporting a clasp. All the gold pendants consist of the head of the goddess Hathor set over a palmette, but they are made from several slightly varying punches. In addition, some are simply stamped in sheet gold, while others have features outlined with granulation. Gold tubes of coiled wire are attached to the tops of all the pendants. The tubes vary in length, but all are made in the same technique and are held by solid gold rings at both ends. The finials are larger cylinders decorated with filigree and closed at their terminations with hollow globules. Attached to one globule is a double eye; to the other, a corresponding double hook ending in snakes' heads. A pierced thread hole at the lower end of each finial allows them to be attached to the necklace. Despite the differences among the pendants, it is probable that the composition of the necklace is original. Similarly arranged necklaces with closely related Hathor pendants have been found in Praeneste. 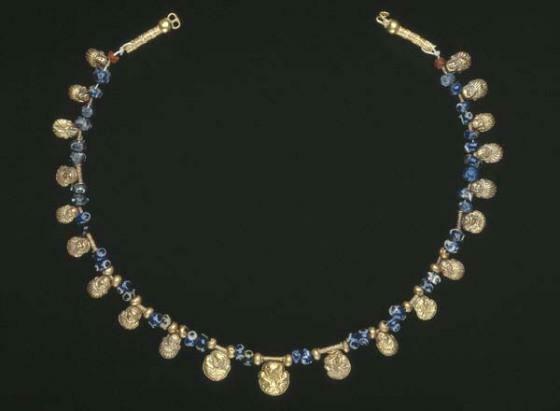 Barbara Deppert-Lippitz, Ancient Gold Jewelry at the Dallas Museum of Art (Dallas: Dallas Museum of Art in association with the University of Washington Press, 1996), 37; 127-28.